June 2009 ~ I Can Do That! Suman, a Filipino snack wrapped in banana leaves is usually made of either raw or precooked glutinous rice. The bundles are boiled in plain water for about an hour and they are best eaten with ripe mangoes, with coconut milk sauce, or simply dipped in sugar. About three years ago I read about the millet seed suman which is a favorite in the Visayan region of the Philippines. The seeds are precooked in coconut milk before rolling into fat cigar shape and wrapping in banana leaves. I've never had millet suman before which has a rather funny name, Budbud Kabog, and I have no idea what it means. And I always thought millet seeds are for making birdseed and suet cakes. I found millet seeds at the health food aisle of the Asian grocery. Koreans cook them in rice together with red and black beans. I bought 2 kinds [because I don't know what kind they use in the Philippines], glutinous, from India, which are green in color like green mungbeans, and the yellow-colored non-glutinous from Korea. Here is the recipe which I modified using canned coconut milk. 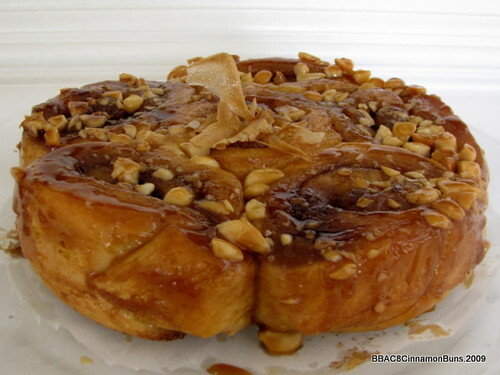 The Bread Baker's Apprentice Challenge 8th recipe is for Cinnamon Buns and Sticky Buns. 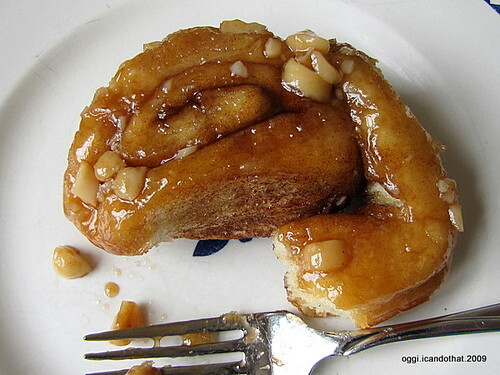 After reading the recipe for the caramel glaze, I couldn't resist making the sticky buns. I halved the rolled dough and the slices from one half dough went into a 9-inch round cake pan, the bottom layered with ¼ inch of the caramel paste and a few tablespoons of chopped macadamia nuts (I ran out of pecans). I love this gooey caramel glaze, it is very good. 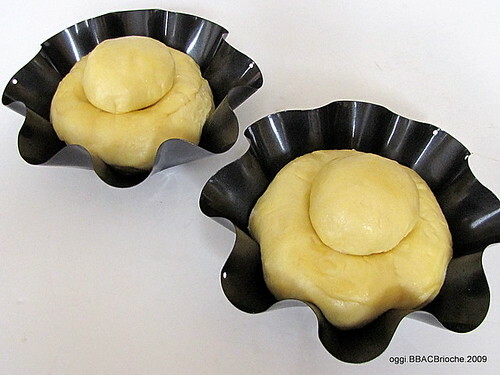 The other half of the dough was mistakenly divided into 8 portions and placed on the baking pan too far apart. 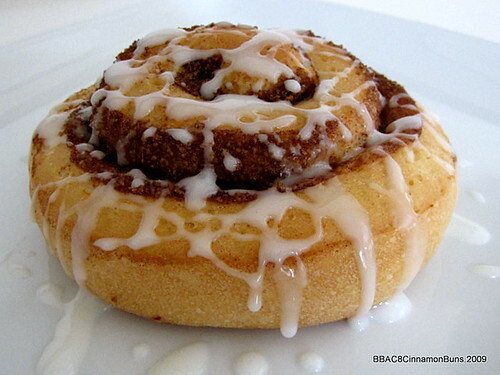 I wanted thick cinnamon buns but it was already cut and they came out a little bit thin. 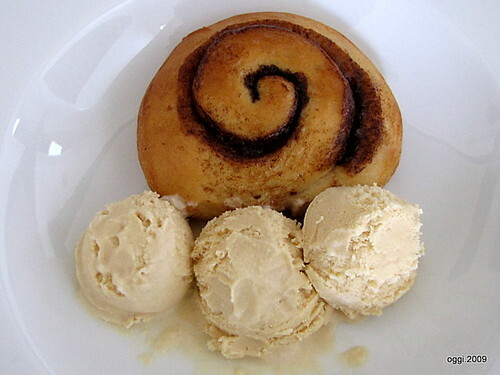 Oh well, I can always bake another batch and make them into gigantic cinnamon buns. And the good thing is they become crispy when toasted and sinfully indulgent if paired with David Lebovitz's Salted Butter Caramel ice cream...it's like eating an open-face ice cream sandwich, sooo addicting. This week's Lasang Pinoy, Sundays: Strips. First thing that came to mind was beef tapa, strips of thinly sliced cured beef, then fried crisp and enjoyed with garlic fried rice and a fried egg or two, the original TapSiLog. 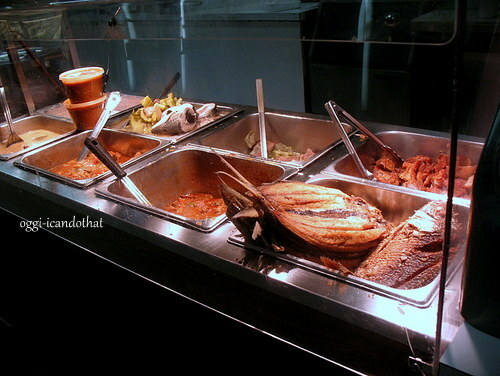 It is also a favorite pulutan (appetizer) to munch on while drinking ice cold San Miguel® beer. Mix pieapple juice, salt, sugar, and pink salt if using. Coat the meat evenly, put in a gallon freezer zipper bag and marinate overnight in the refrigerator. The next day, drain the meat and discard marinade. Pat the meat dry with paper towels. 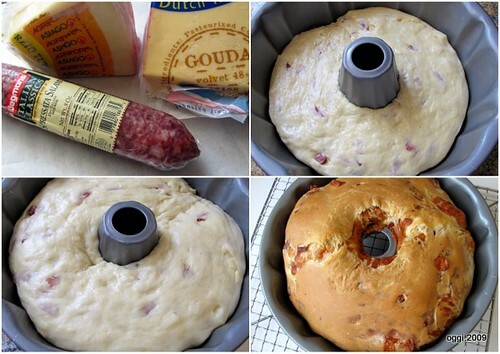 Put slices on racks and place the racks on baking sheets. Dry the beef in a warm oven (less than 200° F) for 1 to 2 hours. Heat 1 tablespoon of oil in a skillet and shallow fry beef until crisp. Tapas are small plates of Spanish appetizers usually eaten in between meals to go with wine. The most common tapas are potato tortilla (omelet), fried chorizos, mushrooms in garlic sauce, cured olives, and prawns also in garlic sauce. I borrowed this tapa combination of Spanish chorizos on a bed of mashed potatoes from the Food section of The Washington Post. The tiny chorizos were grilled and served on a very silky soft mashed potatoes. I made butifarra, another type of Spanish sausage which is very mild compared to chorizo, twisting them every one inch and cooked them on a skillet instead of the grill. I separated them after they were cooked. For the mashed potatoes, I boiled yukon gold with salt and a whole garlic clove. I used the cooking water to make a very soft fluffy mashed potatoes and added about 3 tablespoons of extra virgin olive oil in place of butter. 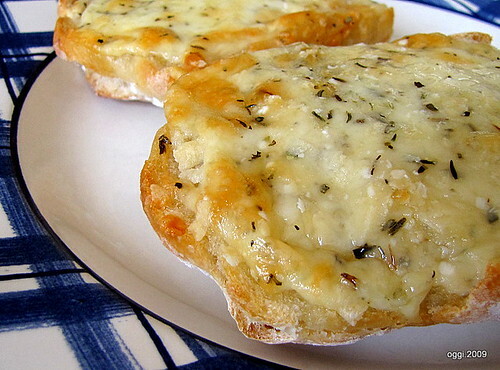 This is a very delicious appetizer or dinner. My recipe for Spanish chorizo is here. Twist every one inch to make into tiny chorizos. 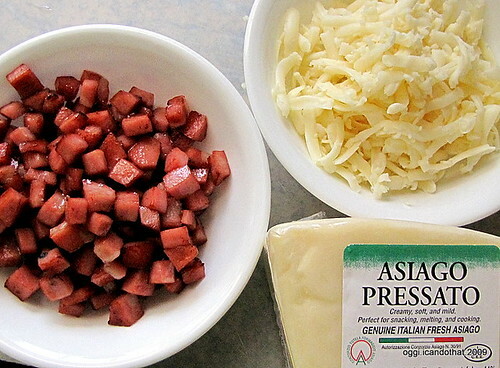 Or slice store-bought chorizos into ¾ inch pieces after cooking. Next time I'll attempt to make José Andrés' deep fried chorizos wrapped in paper thin slices of potatoes. This one sounds really good. 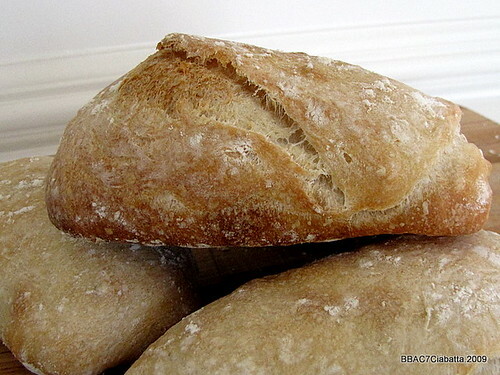 The Bread Baker's Apprentice Challenge recipe 7: Ciabatta. 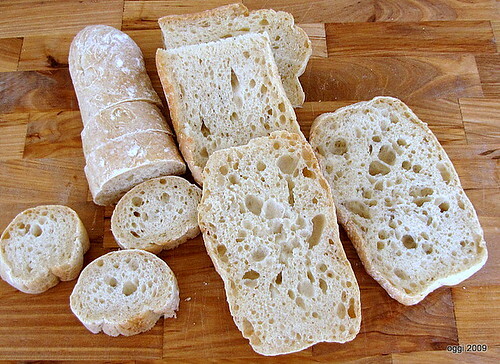 This Italian rustic crusty chewy bread shaped like a slipper has become so popular and when a restaurant started to serve sandwiches using ciabatta several years ago I was eager to try but was so disappointed at first bite. The bread was incredibly leathery or maybe flip-floppy; I thought I was chewing on rawhide. And the bakeries are no better with their mediocre ciabatta but thanks to BBA and other cookbooks, not to mention several websites, I am now able to have freshly baked ciabatta at home that are flavorful and yes chewy but not rubbery. For this challenge I [again] forgot to take photos of the unbaked dough. Sorry about that. Anyway, I divided the dough into four 5-ounce sandwich rolls and the remainder of the dough I shaped into a long thin baguette. The rolls were shaped like a letter just like in the photos and I put them on individual pieces of parchment, uncouched. It is easier to slide them one by one from the peel onto the baking stone. For this recipe I used a poolish which I left in the refrigerator for 2 days to develop more flavor. 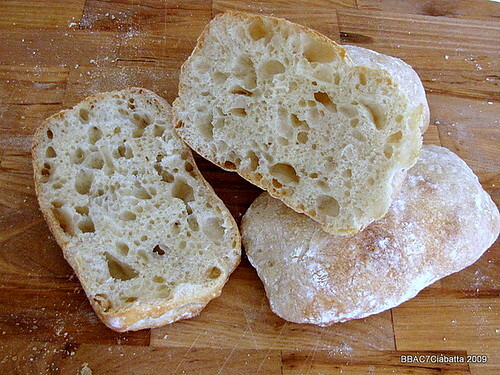 The ciabatta recipe is easy to follow but I find the dough a little bit dry and had to sprinkle a lot of water while kneading because the wetter the dough the more hole-y the bread will turn out. I honestly thought even with the additional water I felt the dough was still dry. And this is what's odd about this batch: three of the sandwich ciabatta rolls have random large air pockets but one didn't have any, just a few medium and small ones. The baguette also has irregular medium and tiny holes in them. 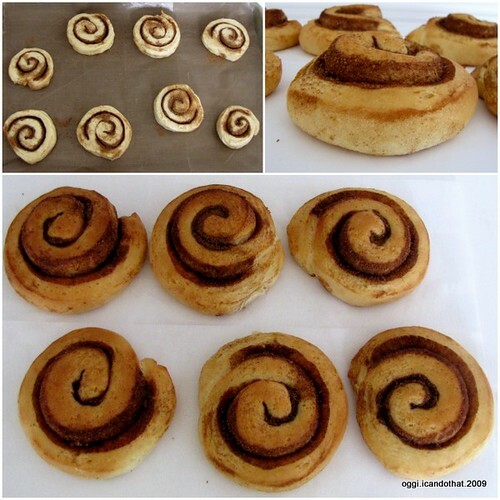 I can't believe these are from the same dough. I suspect my oven has cold spots and I should have baked them in batches. But overall, I like this recipe; the bread is chewy, crusty although not as dark brown as I would have liked, and definitely more flavorful than store-bought. 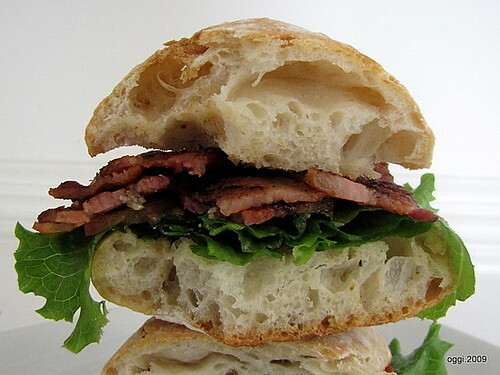 I love it with crisp-fried pancetta, lettuce, and tomato or simply halved and baked topped with mozzarella and parmesan cheese seasoned with dried Italian herbs. I probably will NOT use this recipe again for my next ciabatta as I have PR's ciabatta test recipe for his upcoming book. Guinomis, also spelled with a U, guinumis is a Filipino dessert or snack similar to Halo-Halo. It has diced sweet gelatin, tapioca pearls, puffed pinipig (pounded young glutinous rice), sweetened with raw sugar and pandan syrup, and topped with shaved ice and coconut milk. You will love the different textures of chewy sago and gelatin, crunchy pinipig, creamy coconut milk, and cool mouth feel of the shaved ice. Perfect for summer and sooo yummy. Prepare the syrup: Boil the pandan leaves, water, and panocha or sugar. Simmer, uncovered, and stir until sugar has dissolved completely. Reduce until syrupy. Let cool. Discard pandan and transfer syrup into a serving container or bottle. Assemble the guinomis: Layer 3 tablespoons each: sago pearls, gulaman, pinipig. Drizzle syrup to taste, top with shaved ice, pour 3 to 4 tablespoons of coconut milk. Enjoy! Philippine panocha is available at Filipino and Asian groceries. Gur, the Pakistani and Indian raw sugar lumps are available in the international food section of most groceries (at least in my area). Dark muscovado sugar and raw sugar are also available in many groceries usually at the baking/flour/sugar aisle. You can use regular dark brown sugar but the flavor won't be as good as the panocha. Lasang Pinoy, Sundays: turns ONE! Lasang Pinoy Sundays, a weekly gallery of food photography Pinoy-style, is hosted by SpiCes. To make the topping: Set a medium bowl next to the stove. In a medium stainless steel saucepan, whisk the egg yolks with the sugar and flour until well blended. Whisk in the wine and kirschwasser. Cook over medium heat whisking constantly until the mixture becomes a thick custard. Continue to whisk for 2 minutes (to cook the flour), or until the custard becomes less thick and slightly translucent. Immediately scrape the custard into the bowl. Stir in 1½ tablespoons cream. Place a piece of plastic film on top to prevent a skin from forming. Refrigerate until cool. To prepare the fruit: Pit and halve the cherries. Place them in a bowl, add the kirschwasser, sugar, and lemon juice, stir, and let macerate for at least 15 minutes or for several hours at room temperature. Preheat the broiler with the rack 6 inches from the heat. Taste and adjust sugar and lemon juice. 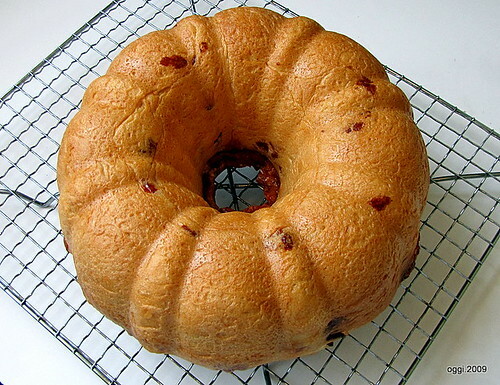 Scrape the cherries and juices into a 4 x 6 oval dish and spread evenly. Broil until cherries are slightly tender and the juices are bubbling, about 5 to 6 minutes. Remove the pan and set aside to cool slightly for 10 minutes. Whip the remaining cream until almost stiff. 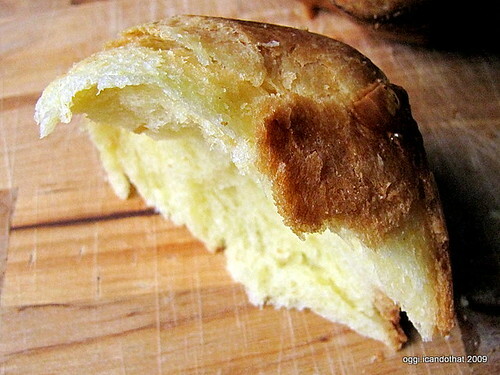 Fold into the cold custard. Spread the mixture on top of the cherries. Slide under the broiler to brown the top, this may take only a minute or less. Serve warm or at room temperature. I can't believe The Bread Baker's Apprentice Challenge is already on its 6th week and my enthusiasm for baking hasn't waned. 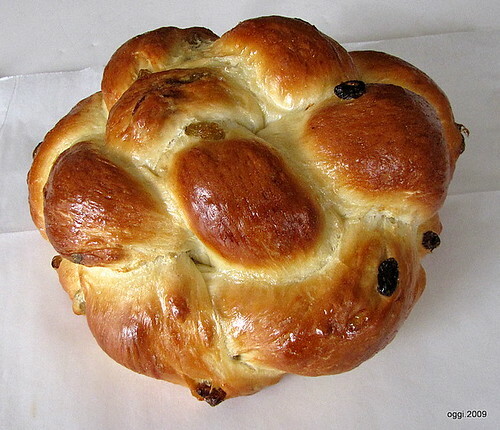 Maybe because this week it's Challah, one of our favorite breads from the first time I saw its dark golden bumpy crust at the grocery. 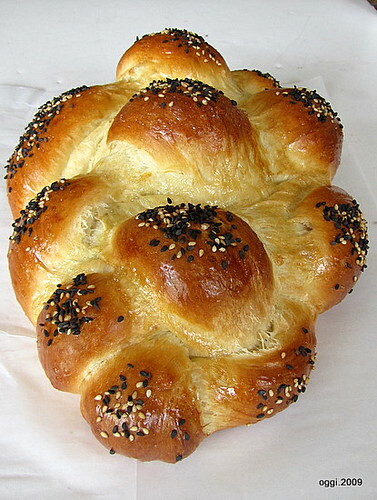 The grocery-store variety are not the very best tasting challah yet I bought the loaves on a regular basis. I only started baking them when I saw a sweet potato recipe and we had it for Thanksgiving dinner last year. It was sweet and delicious. For Christmas I baked a regular one [also] with dried cranberries in the dough. Equally yummy. 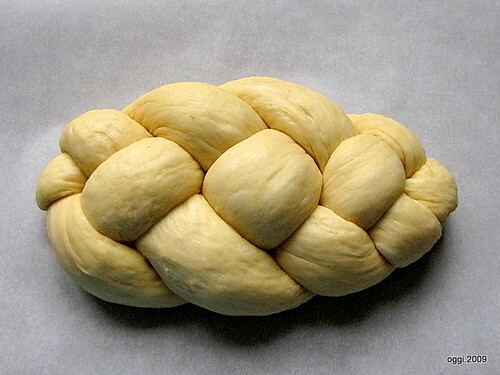 I had always wanted to try my hand at shaping a round challah that I see on the web and this challenge has encouraged me to make it. The BBA has instructions for a 2-strand braid but I wanted a 4-strand round. 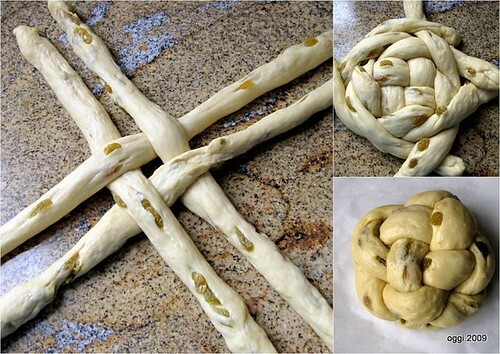 I found this with step by step photographs on how to shape a woven round challah, very easy to follow. After finishing weaving and the dough turned over I was so satisfied and happy with myself for accomplishing something I thought was too complicated. Alice Medrich in her cookbook PURE DESSERT has a recipe for microwaved thinly sliced apples she calls Summer Apple Carpaccio. The apple halves take 45 seconds to cook in the microwave oven and have less than a teaspoon of sugar each. The apple slices become soft and almost transparent but still crunchy and they are served either fanned or shaped to look like garden roses. She suggests pairing them with Rose Water and Mint ice cream or drizzle with caramel ssauce. I adapted her ice cream recipe using orange blossom water because I was not sure if I will like the rose water flavor, doubled the mint leaves for a stronger mint flavor, and increased the milk by just half a cup. The ice cream flavors are so good together and perfect with the simple sweet apple. And the rose apple "petals" look pretty and fun to eat. The apples are also fantastic with Salted Caramel ice cream. Cut the apples in half lengthwise. Peel and core. Place one half apple cut side down on a cutting board and cut crosswise into 1/8 inch slices, leaving the slices in place. Transfer into a saucer, sprinkle with ½ to 1 teaspoon sugar, cover with a bowl, and microwave on high for 45 seconds (1000 watts oven). Cook one half apple at a time. Fan the cooked apple and transfer on a serving plate using an offset spatula. Or shape into roses. Cool completely before shaping. Twist the middle slice without removing it, into a cone to form the bud at the center of the rose. Wrap one or two adjacent slices partially around the bud to resemble the inner petals of the rose. Continue to arrange the adjacent slices, working from the center outward, until the apple looks like an open garden rose. Use an offset spatula to transfer the rose to a serving plate. Blend the mint leaves and milk in a blender. Strain milk through a very fine sieve into a measuring bowl with spout. Add the sugar and stir until completely dissolved. Add the orange blossom water and heavy whipping cream, stir to combine. Pour into an ice cream maker and churn for 20 minutes. Transfer into an ice cream container and freeze until scoopable. Serve with apple carpaccio rose. 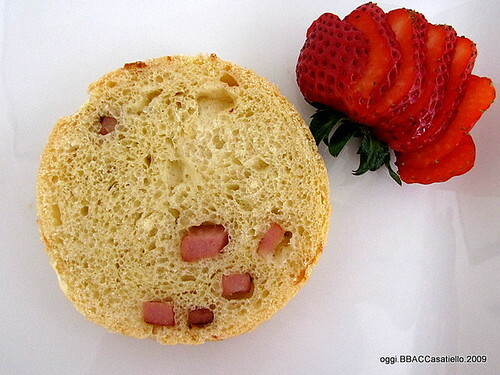 I love the fifth bread in the BBAC, Casatiello. 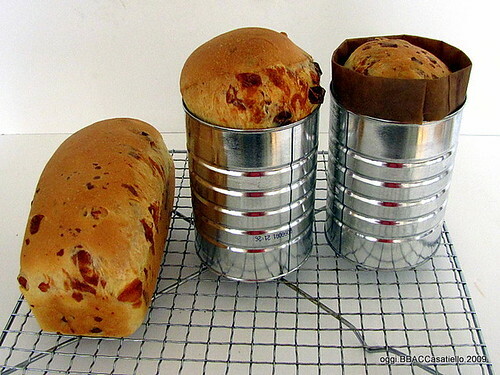 I am so glad I joined this baking challenge because I would never have paid attention to this bread if I hadn't. 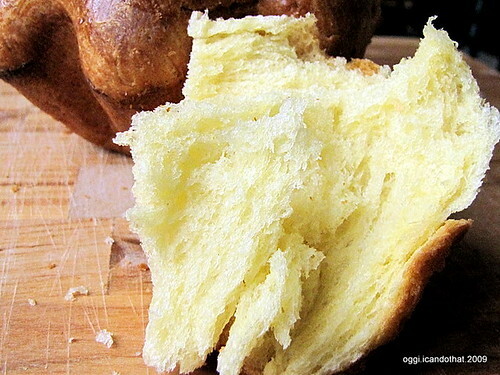 Whenever I flip through the book I always skip it thinking it's just another version of brioche and it actually is. 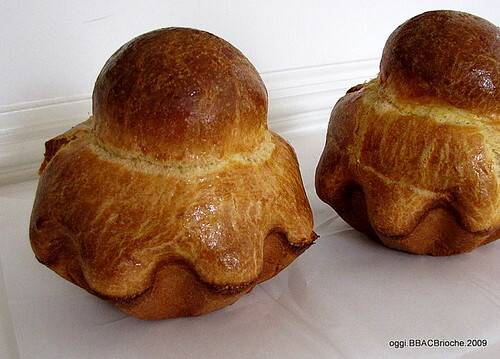 The difference is, this Italian cousin of brioche is filled with meat and cheese. 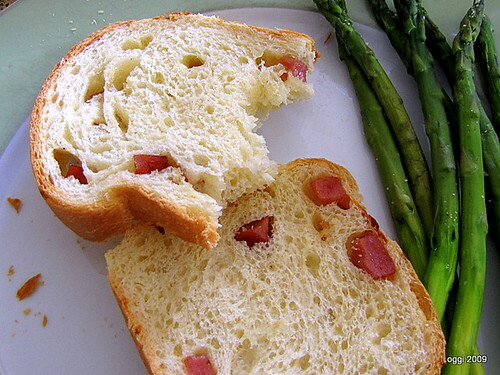 It's a savory buttery delicious bread which I enjoy very much for breakfast with fresh fruits and for brunch with steamed asparagus. It's also very good with a sprinkling of powdered sugar or a drizzle of maple syrup, both sugary additions complement the toasted slices. 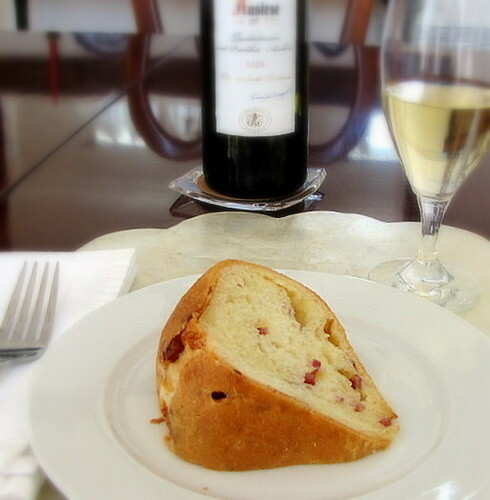 I filled the bread with diced mortadella and grated Asiago pressato. I like the mild flavor of the mortadella, think Spam only better, and I love the bits of fat and whole black peppercorns in it. The meat and cheese came out evenly distributed throughout the bread but I would have liked more filling and should have increased the amount by at least ¼ cup of each. 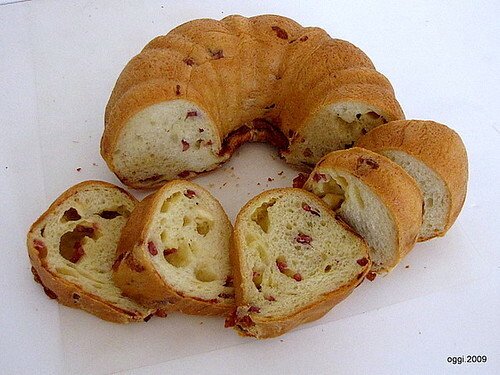 I like this bread so much I baked a second batch (half a recipe), filled it with sopressata and a combination of diced Asiago pressato and coarsely grated young Gouda, and because I wanted to celebrate my "discovery" of this bread I baked it in a bundt pan. Taking a needed break from too much butter, I used extra virgin olive oil to replace almost all of the butter. I'm not sure if it is the olive oil but the second batch is more tender and flakier but just as delicious as the all-butter Casatiello; the flavor of the oil is very subtle, btw. Average: a perfect 5, another winner. Woohoo! The weather is getting unbearable already and it's only the first week of June. When it gets hot I crave for vegetable salads which are very refreshing and a breeze to prepare. I was in the mood for coleslaw yesterday but I didn't have cabbages nor green pepper. What I had in the vegetable bin were 2 aging purple carrots, a yellow beet, and lots of sweet peppers and I imagined these vegetables together would make a good slaw. Well, they are more than good, they are great as a slaw. I used the food processor's medium shredder for the beet and carrots and I sliced the peppers by hand. I added a cup of golden raisins into the mix for a slightly sweet crunchy colorful slaw. Sooo yummy with chicken teriyaki. I will make this salad again with just carrots and jicama with maybe toasted sliced almonds for variety which I think sounds as good if not better. Put the vegetables and raisins in separate piles in one container. Mix the rice wine or vinegar, sugar, and salt and stir until sugar has completely dissolved. Pour all over the vegetables. Cover and chill for at least 1 hour. Toss and transfer into a serving plate. 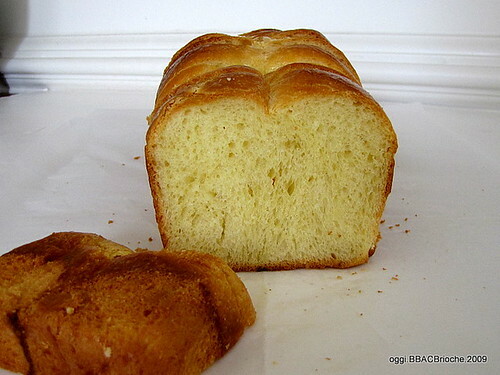 BBA Challenge fourth recipe: Brioche. The book has three options: Rich Man's with 1 pound, yes, 1 pound of butter, Middle-Class with half a pound, and Poor Man's with a quarter pound. 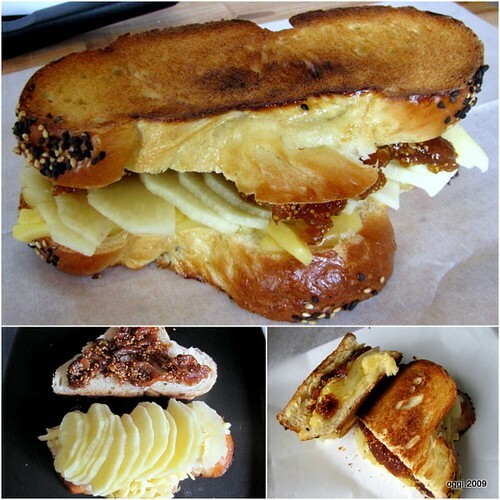 I chose the middle class because I've made the poor man's version several times already and although I am more than satisfied with the PM brioche which is perfect for making Croque Monsieur, I want a richer brioche with more butter but not THAT MUCH butter. The middle-class is very rich and I can't imagine how the rich man's will turn out. I won't know because I have no intention of baking it soon; maybe after we are done with all the recipes I'll take a stab at it. I'm happy with the middle-class with its soft light-as-feather delicious crumb and flaky crust. It's a little bit richer than poor man's as expected but there's very little difference in flavor and texture. 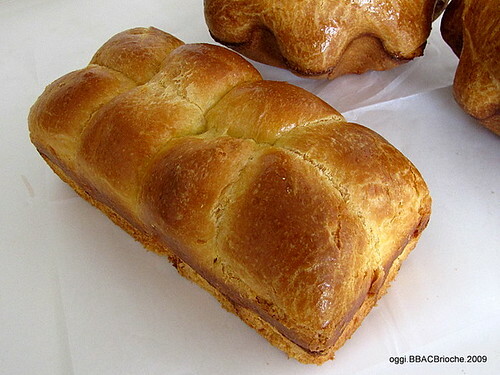 Brioche is one of the breads that I will never get tired of. 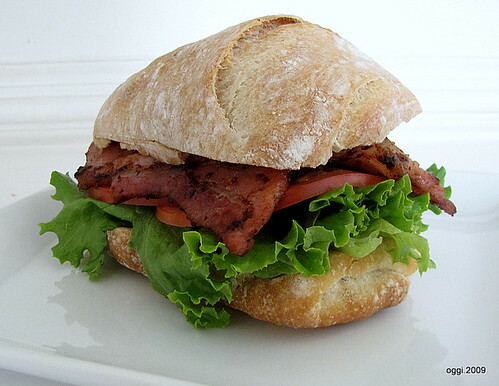 It's easy to prepare and on the eyes, versatile, and did I mention very yummy?